Put the prunes and tea into a bowl, cover and reserve for 12 hours. Place the unpeeled beetroot in a small ovenproof dish. Cover and place in the oven for 1 hour or until very tender. Remove from the oven, cool, peel and cut into thin wedges, reserve. Put the duck, pepper and oil into a bowl and toss well. Heat a large frying pan over moderate heat and gently fry the duck breasts, 8 minutes on the skin side and 4 minutes on the flesh side. Remove from the pan and rest in a warm place for 10 minutes. Meanwhile pour the fat from the pan, and add the wine, let it bubble for 20 seconds then add the beetroot, prunes and the tea and beef jus. Boil until the mixture is slightly syrupy, taste and season. Slice the duck breasts across the grain of the meat. 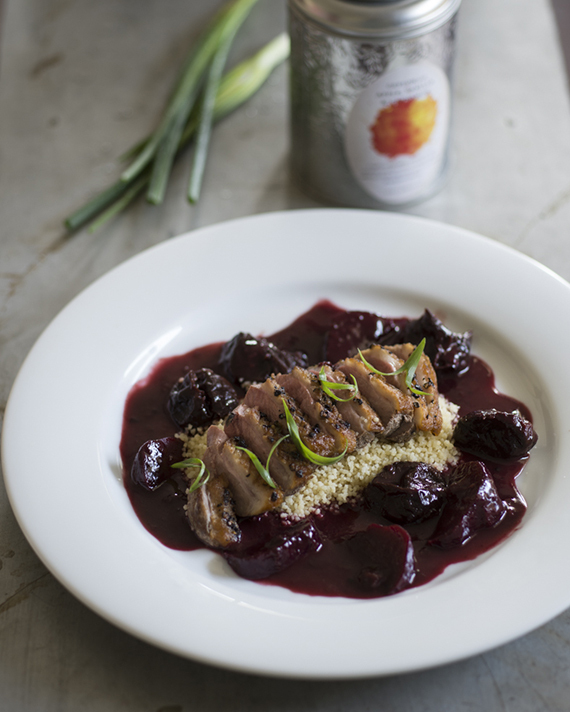 Place the Mograbieh and duck on the plates and put the beetroot, prunes and sauce round it. Sprinkle the spring onions on top and serve.